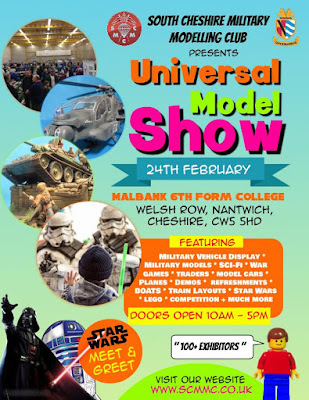 South Cheshire Military Modelling Club’s annual ‘Universal Model Show’ takes place on Sunday 24th February 2019 at Malbank School & Sixth Form College, Welsh Row, Nantwich CW5 5HD. Doors are open 10am to 5pm. Admission price = £3.50, £1.50 for children up to 16 and senior citizens 60+, free for children under 5. Universal Model Show is organised by South Cheshire Military Modelling Club and will feature over 100 exhibitors including a military vehicle display, military models, sci-fi, war games, traders, model cars, planes, demos, boats, train layouts, Star Wars characters, Lego and refreshments. Event Organiser, Steve Morris, said, “This family event has grown year on year and this year is no exception, we are delighted to host such an event that has so much to offer from meeting Star Wars characters to full-size military vehicles...Lego displays to war gaming plus much, much more. We are very grateful to Malbank School for their support with the show and we very much look forward to welcoming all visitors for a day which is out of this world”.